This is a sketch of a suspect released by police, in a public call-out for information about an alleged theft in Lancaster, Pennslyvania. The simple drawing was provided to police by a witness. It is said to depict the suspect who reportedly impersonated an employee at a stand inside Central Market and then stole cash from the business on Jan. 30. Police said the suspect was a 40 to 50-year-old male and about 5 feet 4 inches tall. The person also had a petite build, straight black hair, and wide cheekbones. The male is believed to be South American or Asian. According to the police, the witness provided a detailed physical description in addition to the sketch. Since the initial release of the sketch, the police have positively identified the suspect and issued an arrest warrant for a homeless man Hung Phuoc Nguyen, 44, in relation to the theft. “While the sketch provided by the witness may have appeared amateurish and cartoonish, it, along with the distinctive physical descriptors, jogged the memory of at least one investigator to provide a potential suspect name,” Lancaster police wrote on its Crime Watch page on Feb. 7. Since the sketch was originally picked up by Lancaster Online, social media users have had a field day mocking the cartoonish sketch, with many commenters offering humorous theories about the identity of the suspect. One user said: “That guy looks just like my roommate.” And posted below a picture of the sketch photoshopped on top of his roommate’s face. 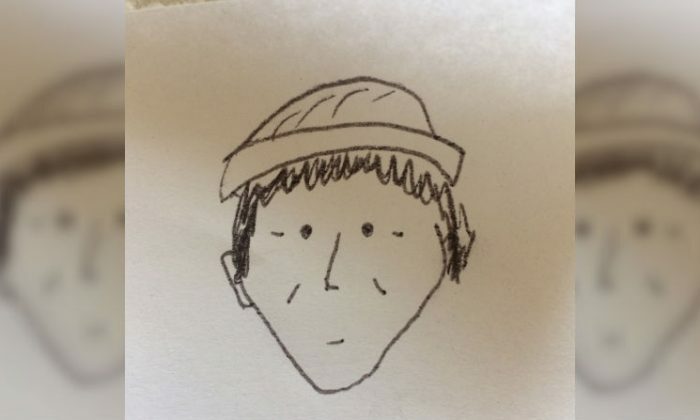 Another commenter likened the sketch to pop artist, Jason Mraz, by pointing out its resemblance to one of Mraz’s album covers — which featured a basic line-drawing of the musician. “I instantly thought of one of my favorite singers…Jason Mraz!” the user posted.